Boss Intense Shimmer is a lighter version of the same blockbuster fragrance, with a beautiful, delicate shimmer. 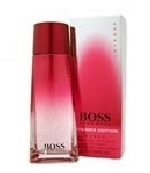 Boss Intense is a unique combination of Vanilla Orchid and Ambery notes. Vanilla Orchid’s strong heart notes are intensified by the warmth and depth of the Amber base notes. The Vanilla Orchid originates from the mountains, though the flower is small in size, its scent is very powerful and distinctive. The orange glow of Amber radiates its warmth through the other notes giving an overall aura of passion and sensuality. Boss Intense is an intensely feminine and sensual fragrance with a sophisticated edge.